This contemporary Bat Mitzvah invitation is raised printed on Lime Green Hue card stock which is layered over Bright Blue Hue, Bright White Linen with Zebra printed pattern, and Black Linen card stocks. 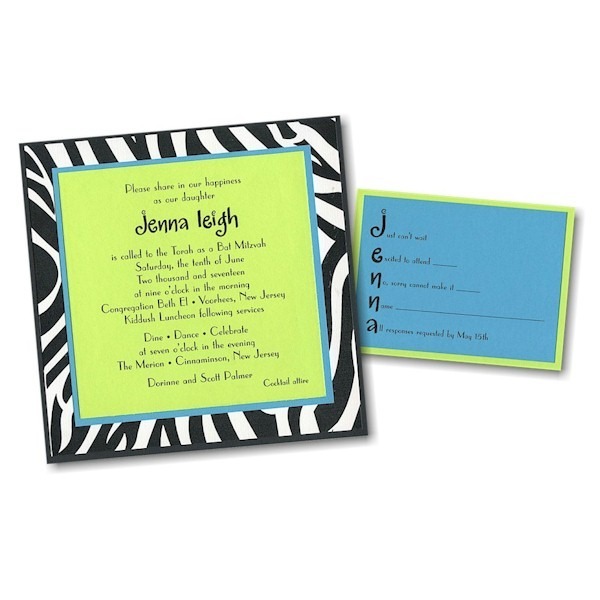 This contemporary Bat Mitzvah invitation is raised printed on Lime Green Hue card stock which is layered over Bright Blue Hue, Bright White Linen with Zebra printed pattern, and Black Linen card stocks. Measures 6-1/4″ square. Shown with Black ink and Lettering styles Parisian (body copy) and Calligraphy #22 (name). 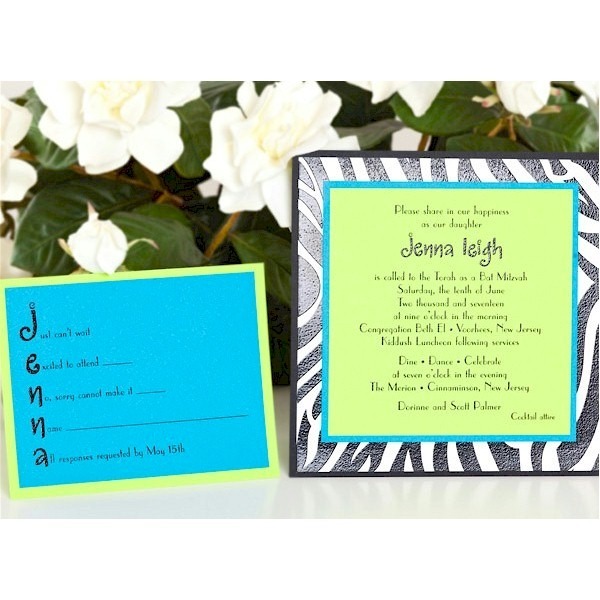 The Reception and Response enclosures will print on layered (Bright Blue Hue/Lime Green Hue) card stocks. The Informal notes will print on Lime Green Hue folding stock. This Bat Mitzvah invitation is accompanied by single Bright White Linen envelopes. Please allow up to 2-1/2 weeks for production time for this fine, high-quality invitation.